"There's a gamification aspect, there's a social aspect, and there's a utilitarian aspect," said analyst Avi Greengart of Current Analysis. Greengart believes cellphone location is in its second stage, moving beyond basic mapping and directions to social and other applications. The third stage may bring uses we haven't even foreseen. 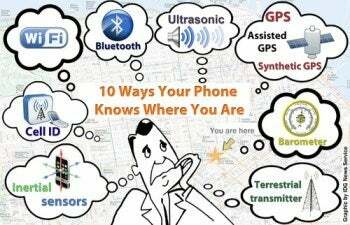 There are at least 10 different systems in use or being developed that a phone could use to identify its location. In most cases, several are used in combination, with one stepping in where another becomes less effective. 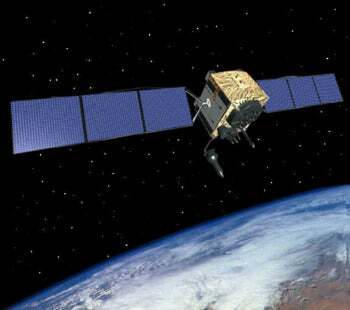 Global Positioning System was developed by the U.S. Department of Defense and was first included in cellphones in the late 1990s. It's still the best-known way to find your location outdoors. GPS uses a constellation of satellites that send location and timing data from space directly to your phone. If the phone can pick up signals from three satellites, it can show where you are on a flat map, and with four, it can also show your elevation. Other governments have developed their own systems similar to GPS, but rather than conflicting with it, they can actually make outdoor location easier. Russia's GLONASS is already live and China's Compass is in trials. Europe's Galileo and Japan's Quasi-Zenith Satellite System are also on the way. Phone chip makers are developing processors that can use multiple satellite constellations to get a location fix faster. GPS works well once your phone finds three or four satellites, but that may take a long time, or not happen at all if you're indoors or in an "urban canyon" of buildings that reflect satellite signals. Assisted GPS describes a collection of tools that help to solve that problem. The form of assisted GPS described above still requires an available data network and the time to transmit the satellite information. Synthetic GPS uses computing power to forecast satellites' locations days or weeks in advance. This function began in data centers but increasingly can be carried out on phones themselves, according to Roy-MacHabee of RX, which specializes in this type of technology. With such a cache of satellite data on board, a phone often can identify its location in two seconds or less, he said. However, all the technologies that speed up GPS still require the phone to find three satellites. Carriers already know how to locate phones without GPS, and they knew it before phones got the feature. Carriers figure out which cell a customer is using, and how far they are from the neighboring cells, with a technology called Cell ID. By knowing which sector of which base station a given phone is using, and using a database of base-station identification numbers and locations, the carriers can associate the phone's location with that of the cell tower. This system tends to be more precise in urban areas with many small cells than in rural areas, where cells may cover an area several kilometers in diameter. Wi-Fi can do much the same thing as Cell ID, but with greater precision because Wi-Fi access points cover a smaller area. There are actually two ways Wi-Fi can be used to determine location. The most common, called RSSI (received signal strength indication), takes the signals your phone detects from nearby access points and refers to a database of Wi-Fi networks. The database says where each uniquely identified access point is located. Using signal strength to determine distance, RSSI determines where you are (down to tens of meters) in relation to those known access points. The other form of Wi-Fi location, wireless fingerprinting, uses profiles of given places that are based on the pattern of Wi-Fi signals found there. This technique is best for places that you or other cellphone users visit frequently. The fingerprint may be created and stored the first time you go there, or a service provider may send someone out to stand in certain spots in a building and record a fingerprint for each one. Fingerprinting can identify your location to within just a few meters, said Charlie Abraham, vice president of engineering at Broadcom's GPS division, which makes chipsets that can use a variety of location mechanisms. If you go into a place where no wireless system works, inertial sensors can keep track of your location based on other inputs. Most smartphones now come with three inertial sensors: a compass (or magnetometer) to determine direction, an accelerometer to report how fast your phone is moving in that direction, and a gyroscope to sense turning motions. Together, these sensors can determine your location with no outside inputs, but only for a limited time. They'll work for minutes, but not tens of minutes, Broadcom's Abraham said. The classic use case is driving into a tunnel: If the phone knows your location from the usual sources before you enter, it can then determine where you've gone from the speed and direction you're moving. More commonly, these tools are used in conjunction with other location systems, sometimes compensating for them in areas where they are weak, Abraham said. Outdoor navigation on a sidewalk or street typically happens on one level, either going straight or making right or left turns. But indoors, it makes a difference what floor of the building you're on. GPS could read this, except that it's usually hard to get good GPS coverage indoors or even in urban areas, where the satellite signals bounce off tall buildings. One way to determine elevation is a barometer, which uses the principle that air gets thinner the farther up you go. Some smartphones already have chips that can detect barometric pressure, but this technique isn't usually suited for use by itself, RX's Roy-MacHabee said. To use it, the phone needs to pull down local weather data for a baseline figure on barometric pressure, and conditions inside a building such as heating or air-conditioning flows can affect the sensor's accuracy, he said. A barometer works best with mobile devices that have been carefully calibrated for a specific building, so it might work in your own office but not in a public library, Roy-MacHabee said. Barometers are best used in combination with other tools, including GPS, Wi-Fi and short-range systems that register that you've gone past a particular spot. However, shopper loyalty company Shopkick is already using a short-range system to verify that consumers have walked into a store. Instead of using a radio, Shopkick broadcasts ultrasonic tones just inside the doors of a shop. If the customer has the Shopkick app running when they walk through the door, the phone will pick up the tone through its microphone and the app will tell Shopkick that they've entered. The shopper can earn points, redeemable for gift cards and other rewards, just for walking into the store, and those show up immediately. Shopkick developed the ultrasonic system partly because the tones can't penetrate walls or windows, which would let people collect points just for walking by, CTO Aaron Emigh said. They travel about 150 feet (46 meters) inside the store. Every location of every store has a unique set of tones, which are at too high a frequency for humans to hear. Dogs can hear them, but tests showed they don't mind, Emigh said. Australian startup Locata is trying to overcome GPS' limitations by bringing it down to Earth. The company makes location transmitters that use the same principle as GPS but are mounted on buildings and cell towers. Because they are stationary and provide a much stronger signal to receivers than satellites do from space, Locata's radios can pinpoint a user's location almost instantly to as close as 2 inches, according to Locata CEO Nunzio Gambale. Locata networks are also more reliable than GPS, he said. The company's receivers currently cost about $2500 and are drawing interest from transportation, defense and public safety customers, but within a few years the technology could be an inexpensive add-on to phones, according to Gambale. Then, service providers will be its biggest customers, he said. Another company in this field, NextNav, is building a network using licensed spectrum that it says can cover 93 percent of the U.S. population. NextNav's transmitters will be deployed in a ring around each city and take advantage of the long range of its 900MHz spectrum, said Chris Gates, vice president of strategy and development.